C.T. Branin Natatorium, 1715 Harrison Ave NW, Canton, OH 44708 (Next to the Pro Football Hall of Fame). 50 meters by 8 lanes, Colorado Timing system with digital scoreboard. Spectator seating for over 2000 people. Diving well for continuous warm-up and warm-down during competition. The competition course has been certified in accordance with 104.2.2C (4). The copy of such certification is on file with USA Swimming. 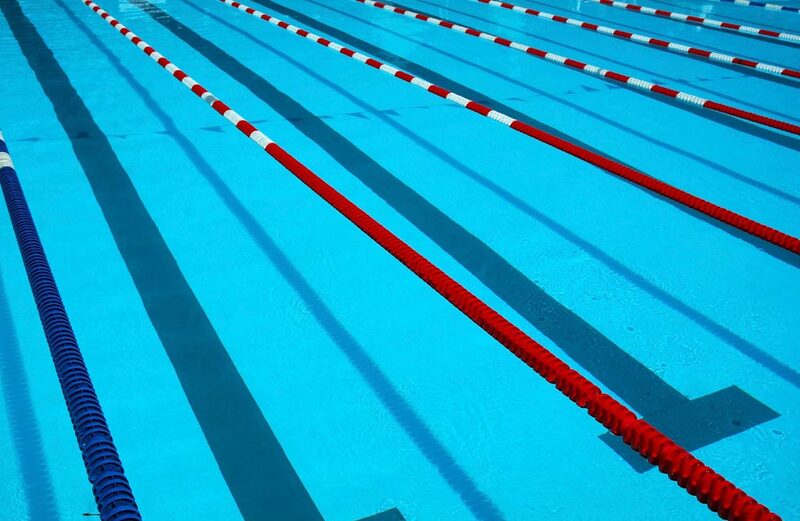 The depth of the pool at the start end is 9 feet 0 inches to 7 feet 0 inches. The depth at the turn end is 3 feet 6 inches. Any swimmer entered in the meet must be certified by a USA Swimming member coach as being proficient in performing a racing start or must start each race from within the water. When unaccompanied by a member-coach, it is the responsibility of the swimmer or the swimmer’s legal guardian to ensure compliance with this requirement. Friday session warm-ups will be 4:45 – 5:30 p.m., with competition starting at 5:35 p.m. Both Saturday and Sunday morning session warm-ups will be 7:45 – 8:30 a.m., with competition starting at 8:35 a.m. Warm-up will be split by team if the average number of swimmers per lane is scheduled to exceed 30 swimmers per lane, into a minimum of two groups, in which case warm-up shall be a minimum of thirty (30) minutes per group for swimmers age 14 and under, or a minimum of forty (40) minutes per group for swimmers age 15 and over. Afternoon warm-up will begin 15 minutes after the conclusion of the morning session. Afternoon warm-up will be for a 45 minute period. Estimated afternoon start times will be posted at www.lakeerieswimming.com by Wednesday, May 29, 2019. At the discretion of the Meet Director, warm ups may be split by gender or age group or team. Teamswho are entering swimmers but will not have a coach at the meet should arrange ahead of time for another coach to supervise their athletes. Swimmers without coach supervision must contact the Meet Director or Meet Referee to be assigned to a coach on deck. Under the Ohio Return to Play Law governing concussions, all coaches and officials (in state or out of state) are required to have proof of training in concussion signs and symptoms. This training is available for free and can be found at http://www.NFHSlearn.com/self_courses. All coaches and officials are encouraged to take this training. It is your responsibility to take care of this requirement. The 1500 on Friday evening is $10.00. Individual events on Saturday and Sunday are $5.00; Relays are $10.00; plus a $3.00 per swimmer LESI surcharge. There is a $1.00/swimmer handling fee for entries not furnished in an electronic file. Make checks payable to CCS Swim Team Boosters. Swimmers may enter four (4) individual events/day exclusive of relays. Will be accepted at the discretion of the meet director and that information about deck entries will be published after the entry deadline on www.ccsswimteam.com and www.lakeerieswimming.com. If deck entries are accepted they will be will be seeded at NT and cost will be 10.00 per individual event; $15.00 per relay event. Deck Entry swimmers new to the meet will be charged a $3.00 LESI Surcharge and must provide proof of USA Swimming Registration. Swimmers must be current athlete members of USA Swimming. Coaches must be current coach members of USA Swimming and must check in for each meet or session they attend. All coaches must display the deck pass (wristband is required to be worn by all coaches) issued by the meet host. Age is as of the first day of the meet, May 31, 2019. On deck USA Swimming registration will not be available. No qualifying times for this meet. Please list times in long course meters. Entries for swimmers with a disability should be handled in the following manner: (1) enter the swimmer in the Hy-Tek database (or on the regular entry form); (2) list in the email accompanying the Hy-Tek entry file (or on a separate sheet of paper) the name of the swimmer, the stroke(s)/distance(s) s/he wishes to swim, the entry times, the day/session s/he wishes to swim the event(s), and the manner in which s/he prefers to be seeded (with a longer distance or with a different age group); and (3) provide any information about special accommodations needed by the swimmer. The final determination of seeding will be made by the Meet Referee after consultation with the swimmer and his/her coach. The meet will be conducted according to the rules set forth in the current USA Swimming Rules and Regulations. Events will be contested in a 50-meter course and will be timed finals. The 1500 Free (event 1) will be mixed and swam fastest to slowest and heats may be limited. The 400 IM (Events 54 & 55) and 400 Free (Events 110 and 111) will be swam fastest to slowest, alternating women & men and heats may be limited. Teams will be notified of where swimmers are seeded in these events by Thursday, May 23, 2019. These are deck seeded events and only those who check in will be seeded. Anyone who does not want to take the chance of getting closed out will receive a refund by notifying Sarah Tobin at ccsmeetentries@gmail.com by Friday, May 24 that they wish to receive a refund or they may switch to another event on a space available basis. Those who check in for an event at the meet but are closed out will receive a refund at the meet. Those who do not withdraw by May 24 and fail to check in at the meet will not receive a refund. For the 200 Relays, swimmers at the shallow end must start in the water. All individual & relay events will be deck seeded. All swimmers must check in at least 30 minutes prior to the start of their session for events seeded on the deck. Check in sheets will be posted on the pool deck under the scoreboard located by the diving well. Relay cards must be turned in upon call in order to be seeded. In accordance with 102.1.4, events may be seeded together but scored separately. The Lake Erie scratch rule (attached) will be in effect. Meet will not be scored. A Clerk of Course will NOT be provided. Results will be posted on www.lakeerieswimming.com web site. Teams may request a TM file at the conclusion of the meet. Saturday PM – 15 minute break prior to afternoon warm-up. Check www.lakeerieswimming.com for estimated start times.